Male of the Madagascan Ambohima sublima, with enlarged inset of the clasping apparatus of metatarsus I, from Griswold et al. (2012). The Phyxelididae, the lace web weavers, are one of the families of spiders to have appeared on the scene in recent years as a result of the collapse of the 'amaurobioids'. 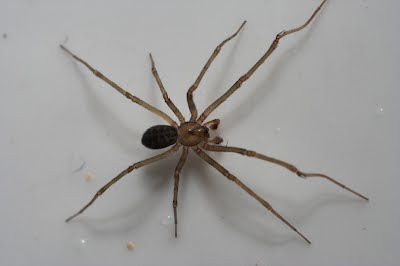 They are a family of smallish spiders found mostly in eastern Africa (including Madagascar). A single species, Phyxelida anatolica, is found in Cyprus and southeast Turkey, and the genus Vytfutia includes two species found in Sumatra and Borneo. Distinguishing features of the family include a series of thickened setae on the inner side of the pedipalp femur in both sexes. 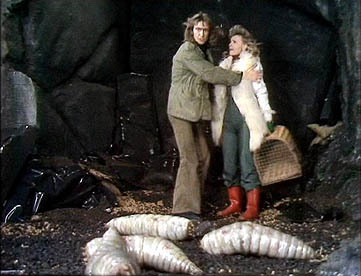 These are expected to function as a stridulatory apparatus; this has not yet been robustly confirmed, though individuals have been observed making jerking movements of the palp prior to copulation that may suggest stridulation (Griswold et al. 2012). Another significant feature is the presence in most species of modified first (and sometimes second) metatarsi in the males, used for grasping the female during mating (Griswold et al. 2012). In Vytfutia and members of the tribe Phyxelidini, a large articulate spur atop an apophysis on the metatarsus sits against a spinose depression. In the tribe Videoleini, there is no spur but there may still be a spinose apophysis (Griswold 1990). 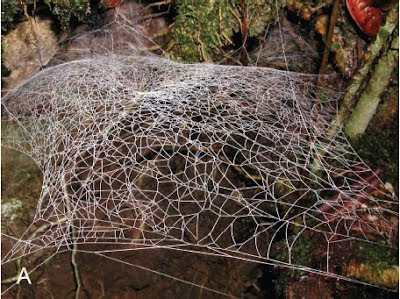 Web of Ambohima sublima photographed by Joel Ledford, from Griswold et al. (2012). Phyxelididae produce tangled or sheet webs from cribellate silk, which they generally place in secluded locations such as under rocks or logs (a few tropical African species are found in caves). For the most part, the family exhibits what is known as an 'afromontane' distribution: though found in most altitudes in the southernmost part of Africa, tropical African members of the family are restricted to alpine localities or caves. The southeast Asian Vytfutia, placed by Griswold (1990) as the sister taxon to the other phyxelidids, differs in being found in a lower altitude in primary rainforest. A molecular analysis by Griswold et al. (2012) agreed with the morphological analysis of Griswold (1990) in separating Vytfutia from the rest of the Phyxelididae (the molecular analysis also failed to confirm monophyly of Phyxelididae including Vytfutia, but its coverage was perhaps not adequate to make this a reliable result). However, rather than dividing the African phyxelidids between the Vidoleini and Phyxelidini, Griswold et al. 's (2012) analysis placed the Vidoleini as a monophyletic subgroup of a paraphyletic Phyxelidini. Nevertheless, this would strengthen Griswold's (1990) earlier inference that the modified metatarsus I was part of the ancestral morphology of the Phyxelididae, and its absence in certain Vidoleini a secondary loss. South African phyxelidid photographed by Alan. Though identified as a possible Vidole species, the morphology of metatarsi I indicates a member of the Phyxelidini. Griswold, C. E. 1990. A revision and phylogenetic analysis of the spider subfamily Phyxelidinae (Araneae, Amaurobiidae). Bulletin of the American Museum of Natural History 196: 1-206. Griswold, C. E., H. M. Wood & A. D. Carmichael. 2012. 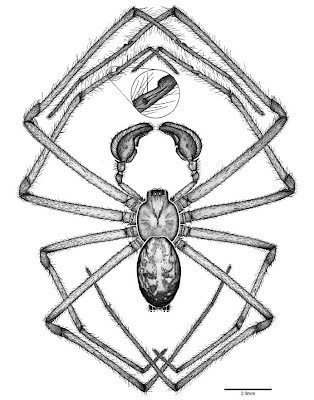 The lace web spiders (Araneae, Phyxelididae) of Madagascar: phylogeny, biogeography and taxonomy. Zoological Journal of the Linnean Society 164: 728-810. Thank you for the fascinating post! 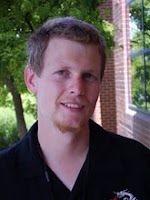 You mention a "collapse" of the amaurobioids. Coddington was still defining them in 2005, in Spiders of North America (Ubick et al. ), though he placed this family separate from them. Have the amaurobioids further collapsed since 2005, or is the current clade just the current remainder of a collapse in progress? Thanks! I think some of the taxa I referred to in the post on Amphinectidae are still yet to be tested phylogenetically, so we may not have seen the last of family reshuffles among the old (by which I mean pre-1990s) amaurobioids.